The value of the canine nose is well-documented, and working dogs are being utilized for their olfactory skills in an increasing number of fields. Not only are dogs used by police, security, and the military, but they are also now used in forensic science, in medical detection of disease, in calculating population trends of endangered species and eradicating invasive species in protected environments, and in identifying infestations and chemical contaminants. 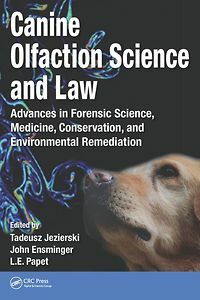 Edited and contributed to by eminent scholars, Canine Olfaction Science and Law: Advances in Forensic Science, Medicine, Conservation, and Environmental Remediation takes a systematic scientific approach to canine olfaction. It includes work from scientists working in pure and applied disciplines, trainers and handlers who have trained and deployed detection dogs, and lawyers who have evaluated evidence produced with the aid of detection and scent identification dogs. The various contributors describe cutting edge research, some conclusions of which are the subject of vigorous debates between various laboratories and researchers. The editors have added cross-references so that readers can consider the different perspectives that are currently being advanced and understand where consensus is being built and where more research needs to be done. 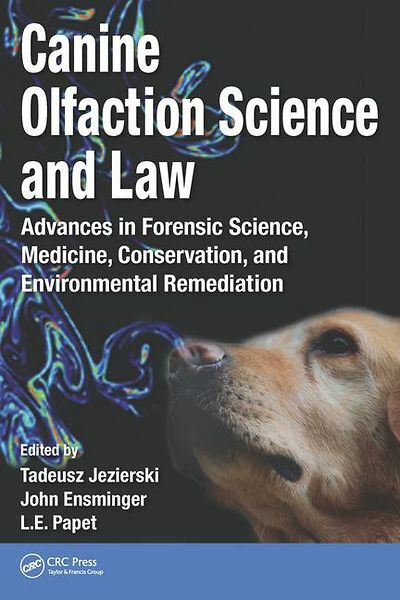 A useful practical reference, Canine Olfaction Science and Law provides a wealth of information beneficial to a wide range of disciplines. It aids trainers and handlers of detection dogs as well as various professionals in healthcare, law enforcement, forensic science, and environmental conservation to gain a better understanding of the remarkable power of the canine nose while encouraging further advances in applications.